Now that the dumpster-fire-of-a-year 2016 is over, it's time to start ordering parts again and burn through the rest of this build list. I hope to have everything bought and built by mid-February at this point. With the current parts I have I can make an entirely (mechanically) functional rifle. Only thing missing to make it usable is the last expensive purchase - the Midwest Industries flip-up front and rear sights. The bolt carrier group still needs to be updated to a new one, but for the time being the original will still work just fine. It's not a required purchase, just a preferred one, which also goes for a new charging handle. Finally I can say the build is almost complete with only a few parts remaining to order. After sights, new BCG and a charging handle it'll be the rifle sling and just adjusting the position of a few pieces (i.e. sling mounts, foregrip, etc.) to my liking and I will have an overall more functional, usable rifle. With parts finally starting to arrive I'm beginning to realize the need for organization. With at least 16 different parts\accessories coming from multiple vendors at different times definitely calls for the need for stay organized. For my sake, I'll be separating the AR project into two major sections: Upper and Lower. It may seem obvious, but quite a few people just look at everything as just a pile of parts, but my brain needs some form of order to accomplish this build. Of course the actual new upper is first and foremost on this list, but of course many accessories will be added to increase functionality. *BCM Keymod Rail Section 5.5"
The lower assembly, which of course includes the Olympic Arms lower I'm starting with has a lot more complexity than the upper. Parts are more intricate and smaller or changing parts out at least involves the careful handling of smaller parts like pins and springs. The buffer tube, buffer spring and stock are also in this category in my thought process. Only a small portion of the parts have been ordered so far. With finances being tight I'm spacing this build out a bit to keep things on an even keel on the home front. So... more to come soon! With the new title of "father" has come many new responsibilities and challenges for me, which press financially, mentally and physically. In order to combat this I have created a project for myself to complete as a hobby while colder New England weather rolls in - rebuilding my AR rifle. Nothing nefarious, but making it more efficient and easier to use and hey... a hobby is a hobby. My more or less "vanilla" AR-15 is an Olympic Arms AR-15a2. It has remained relatively unchanged since I got it 6 years ago. The concept of modifying firearms didn't really catch my attention until the last couple of years. It has a traditional front fixed-sight and fixed carry handle and rear sight. When I had gotten it the traditional full A2 buttstock had been replaced by a cheap collapsible TAPCO stock (along with the buffer kit), which was more or less the only thing changed from it being completely factory. Oh and you can't forget the rather bizarre muzzle brake that would knock the wind out of anybody standing next to you. At the time it was a good rifle and a fun plinker - it was my first rifle after all. Unknowingly for some time I did possess a favorable upper assembly, which was a mid-length gas system and a decent barrel with a 1:8 twist. In the end the fixed sights and fixed carry handle highly limit how modular the platform can be, so... we must evolve. In my time shooting, browsing of the interwebs, taking classes and being around other shooting enthusiasts has given me countless hours of seeing, handling and firing other AR rifles. After years of the AR platform evolving and manufacturers racing each other to release more and better parts every year the choices are beyond overwhelming. While tinkering with my AMD-65 rifle in the past had given me a small taste of rifle modding I felt not only overwhelmed by the choices available for the AR platform, but also a bit intimidated by the AR's complexity. It was hard to beat the AK's "fix and modify with a hammer and swear words" simplicity in comparison. It wouldn't be much of a project if I just went out and just bought a new rifle, so I'll take what I have (the lower assembly) and improve upon it. The upper assembly, as I stated above is "fixed" and not very modular so it is, in essence "stuck in its ways" so that will go and be the first part replaced. The Olympic Arms lower assembly is solid, so that will be my base to build on. As I write this I've already gotten a few parts, chief among which was a whole new upper assembly and barrel (pictured above). Not only was the price good (even without having a bolt carrier group or charging handle), but I grabbed the last one in inventory. With AR rifles being the center focus of any US political gun conversation it's good to get stock while you can. In the last year or so my posts have been coming out in a diminished capacity. First and foremost I do apologize for this. Lately life has been busy and my priorities in terms of my online presence have pivoted quite a bit. From traditional blogging I've found more of my effort has gone to the subject of motovlogging. Not necessarily because of it's popularity or it's trending value, but just because it's something I have been enjoying more and would like to share. It's also a very active and accommodating online culture. I, of course will continue with this blog as much as I can in the future. I may still prioritize motovlogging first, but I still will find time to come back and share on the subject of Broadminded Survival. There is a level of happiness, akin to that of your first kiss when you buy a brand new vehicle. I had it when I bought my second motorcycle (2014 Yamaha Bolt R-Spec) a couple years ago and I had it just recently when I bought my new truck. It's an odd sensation - drunk on the thrill of something new as you drive it home for the first time. Simultaneously you feel that anxiousness in your stomach of your new bank account balance after the down payment. All in all it's an exciting experience, but once you settle in and the new car smell disappears, you wonder: what's next? For me, it's the possibility to make this truck unique and more functional to my liking. 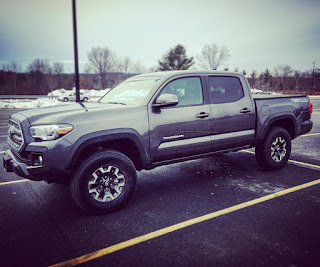 I sold my primary commuter car (2008 Subaru Impreza) in order to purchase this truck as well as my previous pickup (1998 Nissan Frontier), which wasn't going to pass inspection anymore anyway, so the new pickup takes on the responsibility of both. And so far it hasn't disappointed. The interior it feels more like an SUV than an old gym locker, which would describe most older pickup truck cabs. The exterior is all business. 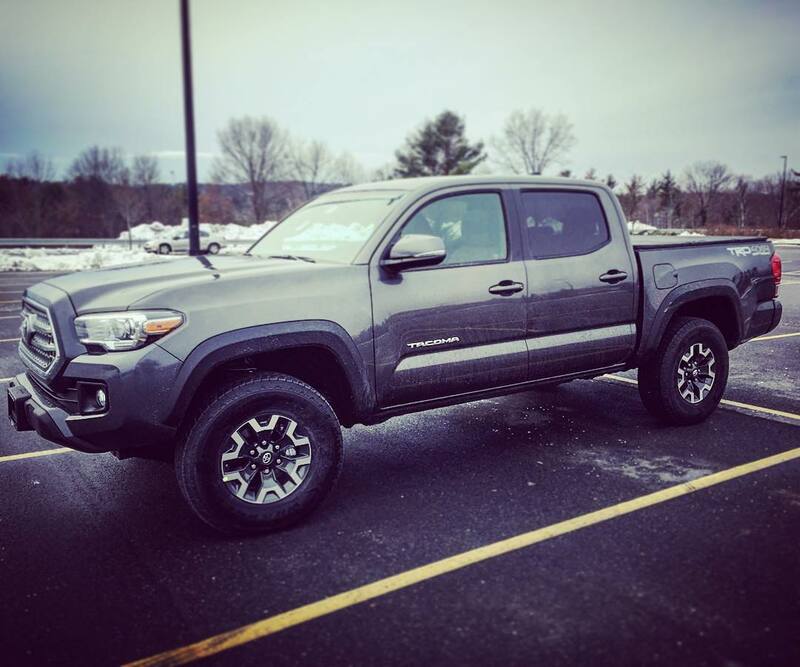 Going forward this new Tacoma will have two purposes: 1.) daily commuting and 2.) bug-out-vehicle. In a short time it has proven to be a comfortable, practical daily commuter, be decent on mileage (even on back-roads), and the concept of getting out of dodge with this seems incredibly plausible. With my previous primary vehicle, the Subaru Impreza, I knew it could handle rain, snow and a multitude of other on-road conditions, but off road? Not so much. My 1998 Nissan Frontier 4x4 was ready for more hairy situations, but its age and the condition of the frame made me weary when driving and its 4-cylinder engine was more cute than practical. Now I have a vehicle that fits the bill for any activity I may have planned or any unplanned emergency that may fall upon us. With winters getting more and more serious (as I write this the U.S. capitol is seeing the worst winter in over 90 years) in our neck of the woods I feel that a car, even with all-wheel-drive may not be enough to get my family and myself out of harm's way. While the daily commuting side of the truck doesn't really need modifying, the BOV side certainly could use some polishing. For transportation, I can safely transport my family (dog included) as well as enough supplies to get us to a number of different bug-out locations within 100 miles. One of the most important, yet simple packages that came with the truck was the tri-fold bed cover, allowing for the covered transport of anything that will fit into the 5-foot bed. Inside, like the previous generation Tacoma there's some storage hidden under the rear seats, especially in a full Double Cab model. With that storage there should be enough room for at least one standard 72-hour bug-out-bag at all times. Beautifully animated and illustrated video on the causality statistics of World War II. It may be a little different than you may know. Experiencing a Different World - Outside the U.S. I've done a decent amount of traveling for business as well as pleasure in the last 7-8 years, but usually places that seem familiar within the Western world. But not this time - this time I am quite literally on the other side of the planet. Instead of being back home in New England while the temperatures drop and the Christmas season closes in, I'm working in the hot and humid land of Indonesia. Over the years I've been Canada, Denmark, Poland, Czech Republic and Germany, but nothing compares to the culture shock of visiting Indonesia in comparison. Not only is it a different experience, it's my first time visiting any part of Asia, and what an introduction. Not Japan, China, Singapore or Korea - Indonesia: a country that presides it's rule over 17,000+ islands with an incredibly rich culture and proud history. Indonesia has endured brutal European colonization, Japanese occupation during World War II, politically and ethnically charged-mass slaughtering during the Cold War, corruption and periods of rapid economic change. The country to this day still struggles with widespread poverty, education standard challenges, and getting past four decades of authoritarianism to make way for modern democratic processes to permanently take hold in the state. On the other hand, in all the years of traveling I have never found such friendly people to interact with. Although many do have at least a rudimentary understanding of English, even without a common language it doesn't seem to make communicating with native Indonesians or Javanese any less of a joy. The turbulence in their past and even recent history has yet to falter their everyday upbeat nature in the present. It's apparent that you're somewhere else far, far away when walking or driving (if you're brave enough) down the avenues of Jakarta or even Surabaya. It's a cacophony of street-life screaming at the top of its lungs. From the constant buzz of thousands of small displacement motorcycles, to street vendors selling locally-picked fruits and vegetables, to whistle-blowing police officers, to Javanese music blaring over radios, it's everywhere. The bustle and move is intoxicating to most visitors. There is so much to take in, but there are flaws in the surroundings. One of which is the overwhelming amount of garbage everywhere and often the pungent smell of sewage made worse by the constant heat and humidity. Something I wasn't expecting was that most commercial businesses have their own security checkpoints including the hotel I stayed at and the company's compound I worked at due to crime. And for the record, I refer to it as a "compound" because it's several large warehouses, administration buildings and offices all totaling over 7,500 employees. Visitors not used to summer-like heat all-year-round will find Indonesia's staggering temperature and humidity oppressive. It's like living in Miami where most people try their best to move from one air-conditioned environment to the next. There's often a haze in the skies over cities like Jakarta and Surabaya that's a combination of the pollution, heat and humidity. Standing on a street, even in shade will cause most people to sweat endlessly. It's certainly an experience. Indonesian cuisine is one of the most vibrant and colorful cuisines in the world, full of intense flavor and incredible spice. In 2011, Indonesia cuisine began to gain worldwide recognition, with three of its popular dishes making it to the list of 'World's 50 Most Delicious Foods (Readers' Pick), a worldwide online poll by 35,000 people held by CNN International. With Indonesia's 6,000 diverse populated islands it is no wonder such a unique selection of cuisines arose. Among the Indonesian cuisines there are countless regional dishes from different areas and ethnicity including: Betawi, Sundanese, Javanese, Balinese, Batak, Minangkabau, Malay and more. There is a wide variety of dishes and even vegetarianism is well represented in Indonesia which supports the small numbers of Indonesian Buddhists that practice vegetarianism for religious reasons. Nasi or streamed rice is the staple, surrounded by sayur-mayur (vegetables and soup) as well as lauk-pauk (meat or fish side dishes). Certainly there is something that can be learned with that kind of commitment to unity instead of stomping on people who are different just because of a minority of them that are terrible. You could always make the assumption that all Americans are members of the KKK too, but nobody does that. On the note of international tension seeing the words: "The War on Christians" is a bit heavy-handed in my opinion and although I do feel for those that have been effected in the worst of ways by fundamentalist terrorists in very recent times, this isn't the entire religion of Islam against Christianity. This is a small fringe group trying to stir up Western civilization's opinion of Islam as a whole so that they'll alienate more Muslims and cause them to turn to ISIS - and sadly it's working very well. Go back long enough there was actually a war on Jews. Look it up if you don't believe me, it's called the Jewish-Roman War. That was an actual war and it lasted nearly 70 years and turned the Jewish people into a scattered, persecuted minority for the majority of human history. And yes, that is literally ancient history, but for argument's sake the holocaust isn't. And people wonder why Israel has been fighting and defending itself so aggressively since it's independence. So when you say there's a "War on Christians," maybe you should throttle back on that opinion just a bit because in the grand scheme of things most would not call it a "war." I had asked a colleague here about many of the Christmas decorations I had seen in the hotels and shopping malls. "I didn't think Christmas would be so popular here," I asked. His response was simple: "Everybody just respects the different religions here." Nobody getting bent out of shape because someone said "Happy Holidays" instead of "Merry Christmas" here. And nobody being offended and complaining because there's Christian holiday decorations in public places. Sounds nice to me.